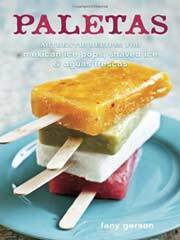 The Greek-style yogurt provides a creamy consistency for this paleta recipe, so you’ll have a rich mouthfeel without any of the guilt. This combination is really quite classic, but feel free to adapt the recipe by replacing the blackberries with any other berry. Yogurt. Berries. Honey. Sounds like breakfast to us. Or lunch. Or dessert. 1. Combine the water and sugar in a small saucepan. Cook over medium-high heat, stirring, just until the mixture comes to a boil and the sugar has dissolved. 2. Rinse the lemon and then slice off the zest, but not the underlying pith, in long strips. (Save the underlying lemon for a different use.) Add the strips of lemon zest to the pan, lower the heat to medium, and simmer for 5 minutes. Let the syrup cool to room temperature. Strain the syrup through a fine-mesh sieve, then refrigerate until chilled, at least 1 hour. 3. Add the yogurt and honey to the chilled syrup and stir until thoroughly combined. Place some of the sweetened yogurt mixture into each of the molds, pouring to a height of about 3/4 inch. Freeze until the mixture begins to set, about 40 minutes. 4. If the blackberries are big, cut them in half. Divide the blackberries among the molds, then pour in the remaining yogurt mixture, dividing it evenly among the molds. 5. If using conventional molds, snap on the lid and freeze until solid, 3 to 4 hours. If using glasses or other unconventional molds, freeze until the pops are beginning to set (45 minutes to 1 hour), then insert the sticks and freeze until solid, 3 to 4 hours. Yogurt Ice Pops with Berries Recipe © 2010 Fany Gerson. Photo © 2010 Ed Anderson. All rights reserved. All recipes and photos used with permission of the publisher. These are pretty fantastic. The yogurt isn’t too sweet at all and is reminiscent of the “froyo” craze. The pops are tangy and refreshing, perfect for a hot summer evening. The only change I would make would be to mash the berries (I used blueberries, but you can use strawberries, blackberries, raspberries, etc.) with the yogurt, so that the fruit isn’t like a little icicle waiting to give you a brain freeze when you bite into it. 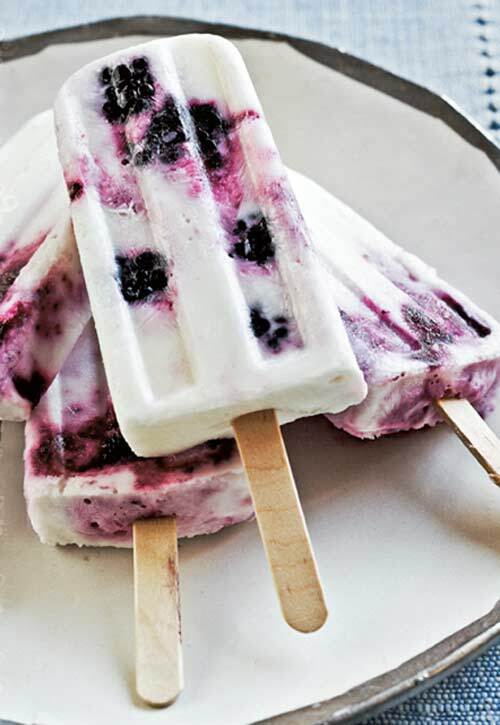 That way, the yogurt would actually take on more of the berry taste, which would make these pops extra special. My daughters and I LOVED these yogurt ice pops, which were so very easy to make. Actually, my teen was the one who made them, with my supervision. The toddler decided that having two would not be enough, so she had four of them at once. Chilling in the fridge only took 10 minutes. How easy and healthy they are — and kids and adults alike love them. The mixture of the Greek yogurt and honey almost reminded me of a smoother and more delicate cheesecake! This recipe really appealed to me, because my kids (and I) love popsicles in the summertime, and we especially love making them ourselves. I liked the idea of using Greek yogurt as a base, since it’s something we generally have in the house and really like. Greek yogurt with honey or agave and blackberries is a favorite snack around here. Unfortunately, all the blackberries I bought for the project mysteriously disappeared, so we had to substitute sliced strawberries and blueberries (although not together). We’ll definitely make these again, though, with any kind of berries. They were a huge, huge hit. Everyone loved them. They were creamy and tart, sweet but not too sweet, and super refreshing on a hot summer night. The only thing I might change in the future would be to puree the berries right into the yogurt mixture, if only to save a step (and I’m all about saving steps right now with five — yes FIVE — kids in my care for the next few weeks). I also think it would appeal more to my eight-year-old, who has a chunky-fruit aversion. I also think this recipe is really ripe (ha ha) for tinkering. I recently made thyme and ginger simple syrups for other recipes, and I think either of them could work really well with various berries in these pops. I suspect we’ll be experimenting with this recipe a lot this summer. The words healthy and dessert have never looked right together. In fact, if a dessert looked healthy, I would ordinarily run the other way. Yet these pops have me reconsidering that stance. The lemon simple syrup really transforms the yogurt, so you don’t feel like you’re eating yogurt. The simple syrup took about one hour from start to chilled. The pops are slightly sweet, and the Greek yogurt makes them feel rich in your mouth. The berries didn’t add much to the experience, but when has a berry ever ruined dessert? These ice pops were simple to put together, especially since I already had the simple syrup in my fridge from a previous recipe. I like to have it on hand in the summer for drinks and icy-type desserts. The pops were delicious, cool, and refreshing. I used frozen blueberries, and although they were a tad too sweet for my taste, the pops were a big hit with everyone, and I will definitely make them again. This was a super-easy recipe, and the pops turned out so pretty and tasted great. I did not let the syrup come to room temperature before I put it in the refrigerator, due to an unexpected trip to pick up children. It still turned out great — we got back home about 90 minutes later and the syrup had chilled so I could continue making the pops. I made them a few times. The first time I used whole blueberries. The recipe says, “If the berries are big, cut them in half,” but we thought even the blueberries should have been cut to let the flavor come out more in the pop. Just frozen in the pop they were still good. I also made the pops with strawberries and blackberries, cutting the blackberries in half and quartering the strawberries — these really turned out beautiful because the yogurt stays very white against the bright pieces of berries. Each time I made six pops, because I had only six molds, and made the rest in parfait glasses — either way they were great. I made the syrup early in the day and let it chill for several hours. I think this also helped the flavors develop nicely. The yogurt mixture had a nice texture and flavor. They weren’t too sweet, either. Simple, quick, and tasty — even relatively healthy for a frozen treat. The lemon syrup took only a few minutes to come together, and it comprised the bulk of the active time. In my petite 1.5-ounce molds, this made about 16 paletas. Since my molds were a bit smaller, the first half of the yogurt mixture didn’t take very long to partially freeze. I’m allergic to cow’s milk, any chance I can substitute soy or coconut yogurt? These are so tasty and even better so easy to prepare. I just got this cookbook and it was much better than I thought it was going to be. I am really excited to cook out of it. And the surprising this is that it is not just about paletas. There are agua frescas and ices too. We couldn’t agree more, Bruce. It’s definitely a keeper. Oh my god, these look delicious! And just in time for the tail end of these hot summer days. oh these look so good, i just dont feel like doing them -.- too lazy, someone come over and make them for me!! Good morning, Lena, and good for you for taking care of yourself! We didn’t try this with low-fat yogurt, but I see no reason why it wouldn’t work. It’ll simply be just slightly lacking in richness, but with yogurt that comes through mostly in terms of mouthfeel, which is largely lost in an ice pop. So yes, you have our blessing. Please let us know how it goes! And despite our adoration for fatty fat fat things, we actually have quite a lot of recipes on the site that are conducive to keeping pounds away. Chances are you’ve already happened upon them, although do let me know if I can send you a list…. I’ve just put them in the freezer! Will review as soon as they are frozen and ready to be eaten away. It already tasted real good unfrozen so I have no doubt it will turn out at least delicious! I will look for those recipes later on, but I’m relieved to know something like that even exists. Thanks for your help! My pleasure, dear Lena! Looking forward to hearing about those ice pops!